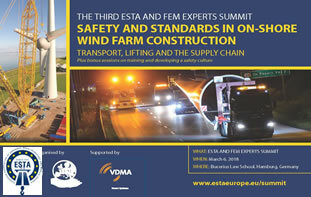 As you are probably aware ESTA is organising a Wind Farm construction Safety summit in Hamburg on March 6thy 2018. The preparations for this summit are now completed and attached I can offer you a definite program for this conference including a speakers list and details for registration. The summit is supported by all major Wind Turbine manufacturers and addresses a lot of topics that are of great importance to our members, the crane and transport companies that are confronted with the problems of reaching sites or erecting wind turbines in adverse conditions. In order to have our voice heard as transport and lifting contractors, a good representation on behalf of our (your) members is of great importance. For the individual companies it is a good opportunity for networking with Wind industry suppliers. Therefore I kindly request you to relay this email with the attachment to your national associations’ membership with a call for attendance. Your kind cooperation in this matter is highly appreciated.